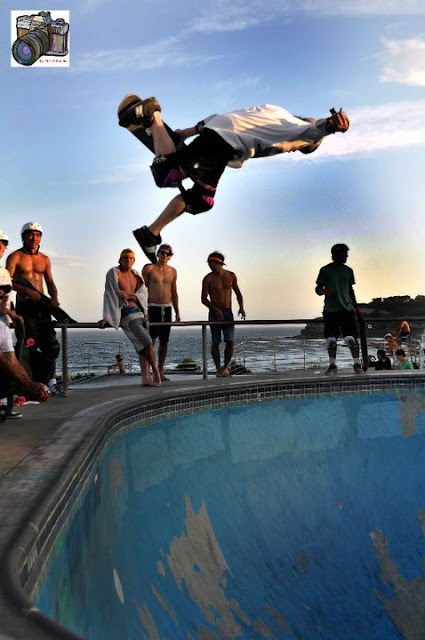 I Skate, Therefore I Am: Bowl-A-Rama soon at Bondi Beach skate park. Fixing the pool before the event. Photo Max O'Rourke. There are only a few amazing skateparks upon-the-beach in the world. One of them lies on the infamous shores of Bondi Beach, Australia. And in a couple of weeks Bondi Beach will host the 6th Vans Bowl-A-Rama contest, the biggest concrete event in the Southern Hemisphere. More than 60 of the world’s best skateboarders will show off their moves to a crowd of more than 6,000 spectators. Some of the most prominent bowl rider of the planet will be flying there including: Lance Mountain, Steve Caballero, Christian Hosoi, Pat Ngoho Bucky Lasek, Omar Hassan, Bob Burnquist, Rune Glifberg, Otavio Neto, Jackson Pilz, Juergen Horrwarth, Renton Miller and Corbin Harris. I head some of them are already there with Sasha Steinhorst. Bondi Beach. Photo Max O'Rourke. The Bondi bowl is one of the most perfect pools to cater to versatile skaters from all over the world, combined with the caliber of riders expected on the day for the biggest prize money in the history of the event. During the new Bowl-A-Rama festival week, skate fans and the general public alike will experience the most mind blowing action of the year! Bowl-A-Rama and all of the umbrella events leading up to the Saturday comp have always been so much fun amongst professional skaters, families and the general public alike. Bowl-A-Rama is about embracing the rising tide of Australian skateboarding and celebrating the week with amazing sponsor parties and festivities, like the Love and Guts Art Show. It all kicks off Wednesday 16th with the WCSK8 Official Rider Registration Party, and runs all week with a mountain of events. The competition is on from 9am to 7pm at Bondi Beach Skatepark. Note that if you plan to go to Bondi for the event, bring your skate, your camera, your hat and a truckload of sunscreen, for they won’t provide some on the site. I should know, I once got burned out at Bondi because of the scorching sun! There are a limited number of rider positions available in the competition; PRO – 40, MASTERS – 24. These positions are filled in order of rank. Any rider with previous WCS points from other prior events will be allowed entry first and the riders with higher ranking will receive first spots. If there are any remaining rider spots these shall be filled via wildcard entry. 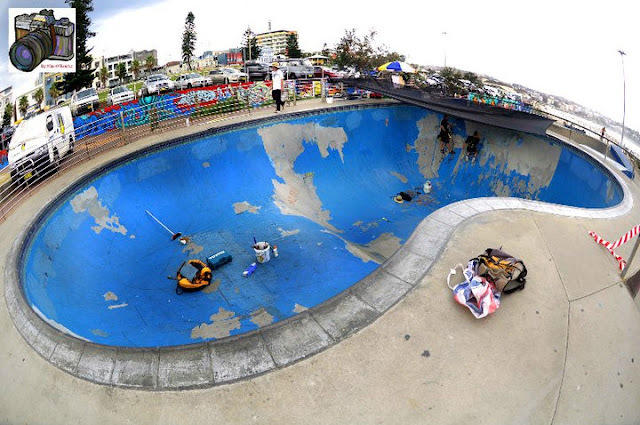 Wildcard entry for Bondi is done through placings at this years’ BOWL-A-RAMA™ Wellington. If a rider is seeking a spot in Bondi and does not have previous WCS points then they will need to enter Wellington to earn their spot for Bondi. Five spots in each division shall be held for wildcards and the highest placed riders in Wellington without WCS points will be ranked in order for these spots. As Wellington is the first stop of the year for the Bowl Series and it is the only event where open pro entry is available so as to accrue WCS points for entry to other WCS Bowl Series events that require points. PRO entry guidelines: All competitors must be at least 16 years of age. If a competitor is younger than 16 then their sponsor must turn them pro to be eligible to enter. Judging of the competition is done so under the WCS Pro Bowl scoring system; tricks, lines, style, flow, fair competitiveness are all parts of the judging criteria. MASTERS entry guidelines: All competitors must be at least 40 years of age and have a history of being paid to ride their skateboard professionally to be eligible to enter. Judging of the competition is done so under the WCS Pro Bowl scoring system; tricks, lines, style, flow, fair competitiveness and having fun are all parts of the judging criteria. It is important to note that if a rider is still competing past the age of 40 they are doing so because it is fun, if they are not having fun then it will reflect in their scores. There is limited free accommodation available in Bondi for riders. The accommodation is provided in line with the ranking system for rider entry. All accommodation is handled by WCS during rider entry period. All pictures by Max O’Rourke, special correspondent of isTia at Bondi Beach.